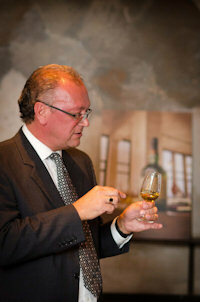 Irish Distillers Pernod Ricard has announced the launch of Redbreast 21 Year Old, the pinnacle of the range to date. To celebrate the newest member of the Redbreast Family, Master Blender Billy Leighton hosted a special tasting in London last night. The new expression is the ninth Single Pot Still Irish Whiskey to be added to the Irish Distillers portfolio and arrives after another strong year for the Irish whiskey category. Redbreast 21 Year Old sits alongside Redbreast 12 Year Old, Redbreast 12 Year Old Cask Strength and Redbreast 15 Year Old to complete the largest-selling and most definitive Single Pot Still Irish Whiskey brand in the world. As the oldest and richest expression in the decorated Redbreast family, Redbreast 21 Year Old is the finest representation of the brand’s signature sherry style. It is made from a mash of malted and unmalted barley, triple distilled in copper pot stills and matured in a combination of American Bourbon barrels and first fill Spanish oloroso sherry casks. The 21 year ageing process introduces new levels of depth and flavour, creating an inherently complex and rewarding whiskey. Whiskey lovers eagerly anticipate the launch of new Single Pot Still Irish Whiskeys and Redbreast 21 Year Old, as the oldest age-statement whiskey in the Irish Distillers portfolio, is anticipated to be notably popular and savoured by Irish whiskey enthusiasts. In the US, Single Pot Still Irish Whiskey continues to perform strongly, driven primarily by the popularity of Redbreast. Brendan Buckley, Global Innovation & Category Development Director at Irish Distillers added: “The increasing global interest in Single Pot Still Irish Whiskey is really encouraging and we see great potential for continued growth at the higher end of the Irish whiskey category. With exciting new Single Pot Still Irish Whiskeys such as Redbreast 21 Year Old, we hope to satisfy both existing fans of this quintessentially Irish whiskey style and lovers of Irish whiskey in general, to help them understand the unique provenance and outstanding quality that the category has to offer”. 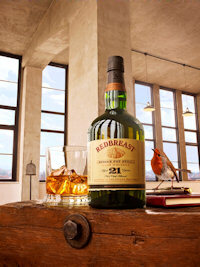 Redbreast 21 Year Old is non-chill filtered at 46% ABV and is available in very limited quantities. The exclusive expression will be available from this month in the USA, France, UK, Ireland and Germany priced at $180.